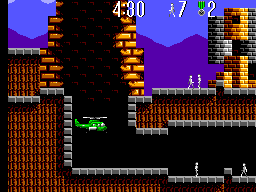 Several versions have been located, all with generally the same layout. However, there is a particuarly rare version with different artwork, layout, and fonts. 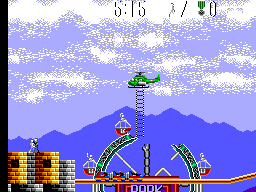 It has thus far been assumed to be a demo or prototype version as only one copy is known to exist. 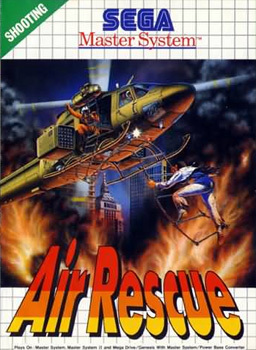 Manuever your helicopter through tight underground passages, blazing wreckage and trecherous enemy attacks to save the leaders of the world from the hands of terrorists! 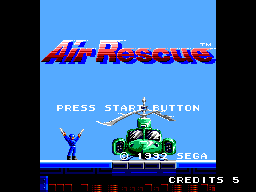 At the title screen, press: Up, Right, Down, Left, Up, Right, Down, Left, Button 1. You can now select your starting level, number of lives, sound test, etc.